Over the weekend the Andrews Government announced a tax on foreign investment in Victorian real estate. This includes a 3% Stamp Duty surcharge and a 0.5% Land Tax premium for absentee owners. On top of the $5,000 foreign investment fee announced by the Federal government, this will add some much needed balance between those looking for housing and those wanting an investment. However, we wait with baited breath for the devil in the detail. The sure winners are Australian property investors who will enjoy less competition from foreign investors. 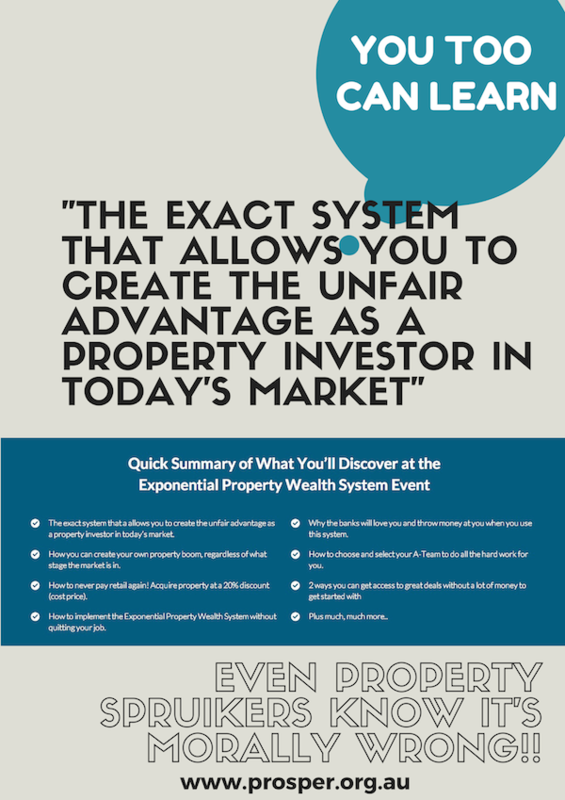 A national property spruiker is currently touring the nation with an Exponential Property Wealth seminar beckoning investors to enjoy their ‘unfair advantage’ (see picture above). Such a move by Andrews will do nothing to unwind local investor advantage. In fact, this ‘reform’ may add further benefit to Australian investors. Whilst the policy announcement allows New Zealand citizens and those with permanent residency to enjoy their unfair advantage, we are yet to see the detail on Real Estate Investment Trusts and property syndicates. Will foreigners be able to invest in local investment entities if under say a 20% capital threshold? REITs are already benefitting from the Significant Investment Visa program. This implies it is bad for foreigners to make money in their sleep, but perfectly acceptable for Victoria’s elite to do so. Hypocrisy we say! An upfront Stamp Duty will curb some demand but established foreign investors will see this as requiring even greater capital gains to justify investments. This may extenuate the number of vacant properties and the investment window held. It could also see further cuts in quality product by foreign developers. The Andrews government did have the common sense to include a Land Tax component to the impositions on foreign investment – although only on vacant homes. Whilst the new 3% stamp duty on a $600,000 home will add some $18,000 to a foreign investment, the 0.5% increase in Land Tax is minimal. For the same home, that equates to an extra $1750 imposition. We await to see how they measure such vacancy. Using water consumption as a proxy for vacancy is the most accurate and efficient measure. If Andrews was serious he would have reversed the tax imposition with a minor Stamp Duty increase and a major Land Tax increase. This would put pressure on foreign investments to be leased out or on-sold quickly, adding to supply. A higher Stamp Duty does the opposite by slowing turnover. Buyers will hold a property until the $18,000 in stamp duty plus their desired capital gain is achieved. Charging $1750 in Land Tax will do little to alter investment behaviour at just 10% of possible rental income. With capital gains running at $40,000 – $60,000 per annum, a $1750 charge is minimal. We will be very interested to see if the new change affects auction clearance rates and off-the-plan sales. With foreign investments doubling in the last five years and hitting some 20% of purchases nationally in 2014, a policy move was needed to protect our sovereignty. Well done Treasurer Pallas for admitting Victorian taxpayers need a return on investment for their public infrastructure. If only we could extend that concern to the immense capital gains those owning real estate near the new Melbourne Metro loop will enjoy. That would reflect the ‘fair go for all’ mantra Australians live by. To meet this, Andrews must go further by demonstrating the exponential wealth delivered by property is bad for the economy, whether for a foreign or local investor. One down, one to go? I doubt a proper system of land taxation will ever be created. For example look at SMSF’s. SMSF investors and negative gearing pose the biggest headache to owner occupied ownership. Now there are tips on how to become a self managed investor through legal loopholes. Governments create, knowing the full consequences of their actions, these loopholes and reap the rewards both monetarily and voter approval. When it all goes wrong and many people start to complain they simply close the loophole, presenting themselves as heroes to win an election and then quietly create another loophole elsewhere. It never ends and will go on as long as people vote, with no conscience, these corrupt politicians into office.